In addition to the images, USA Today interviewed the cast and crew about Wreck-It Ralph 2. We got our first look at the princess crossover in a clip from the film at the D23 Expo, last year. It was hilarious and very meta, it even took some shots at Brave‘s Merida. One thing is for sure, the crowd loved it. That’s because directors Rich Moore and Phil Johnston were able to get most of the original voice actors to reprise their respective roles. This includes Jodi Benson as Ariel, Paige O’Hara as Belle, Linda Larkin as Jasmine, Ming Na Wen as Mulan, Idina Menzel as Elsa, Kristen Bell as Anna, Irene Bedard as Pocahontas, Anika Noni Rose as Tiana, Mandy Moore as Rapunzel, Kelly Macdonald as Merida, and Auli’i Cravalho as Moana. In the clip, we saw Cinderella take drastic measures when first meeting the glitchy Vanellope by breaking her own glass slipper and wielding it in self-defense. Another joke pokes fun at Merida’s thick Scottish accent, to which a princess says that she is from another studio. Her character won’t be the only internet know it all. While her character is very fashionable and blue, “Her tiara is her hair and her ball gown might be a fur coat — digital fur, so no animals died,” Henson said. Alan Tudyk‘s KnowsMore has a more academic look to him. Yes, Tudyk will be returning to voice a new character. 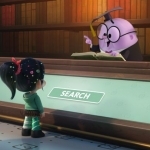 He voiced the nefarious King Candy aka Turbo, a renegade computer program that tried to take over the arcade in the first Wreck-It Ralph. Tudyk has been voicing Disney supporting characters since then. Moore says KnowsMore is “a little Truman Capote, a little Droopy dog from the old MGM cartoons, and a little Mr. Peabody.” He is basically the autofill program used to predict people’s sentences. So now you know who to blame for all those “ducks” you text. Jack McBrayer and Jane Lynch are also returning to voice Fix It Felix, Jr. and Sergeant Calhoun, respectively. The film taking place in the internet will address the generational gap’s understanding of the world wide web. “With Ralph, it’s like when your dad looks at the Internet and goes, ‘What is that? Why is that? What is going on?’” Johnston says. Ralph Breaks the Internet: Wreck-It Ralph 2 hits theaters on November 21, 2018. Click right here for more on the film, including a trailer.